At the peak of Andrew Carnegie's career, he crossed paths with an impressive journalist named Napoleon Hill, who he trusted to document - and share with the world - the strategies that turned him into one of the wealthiest and most successful businessmen of all time. "It was Mr. Carnegie's idea that the magic formula, which gave him a stupendous fortune, ought to be placed within reach of people who do not have time to investigate how men make money," Hill wrote in the preface of "Think And Grow Rich," the result of his collaboration with Carnegie. 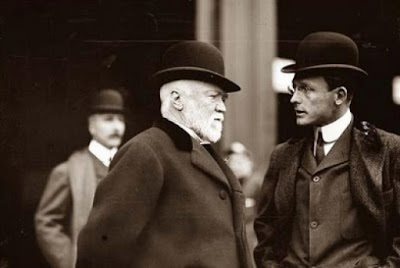 In addition to analyzing Carnegie, who became the richest man in the world after starting with little more than a penny upon arriving in the US from Scotland, Hill studied more than 500 self-made millionaires over a span of 20 years. His interviews and research culminated in the 1937 bestseller, "Think And Grow Rich," which shares what he calls the "money-making secret" in 13 principles. There is no mention of "money," "wealth," "finances," or "stocks" within Hill's text; he takes a different approach, focusing on breaking down the psychological barriers that prevent many of us from attaining our own fortunes. This approach is still relevant today - 78 years later. As personal finance expert Farnoosh Torabi said on episode 1 of her podcast, "Mastering your money has more to do with psychology and mindset than anything else." Consider Sara Blakely, whose small, disruptive idea - making an incision in a pair of pantyhose - amounted to her booming billion-dollar business, Spanx, and rocketed her into the limelight. The subconscious mind will not remain idle! If you fail to plant desires in your subconscious mind, it will feed upon the thought which reach it as the result of your neglect. This principle is simply application of the Master Mind principle. It takes it one step further; rather than just surrounding yourself with people who are smarter and better, use the members of your group to find solutions to problems or brainstorm ideas. Hill calls this "blending of several minds into one," and suggests sitting down with a small group of people and diving deep into the problem at hand. The final principle - the "sixth sense" - occurs only after you've mastered the other 12 principles. You'll experience a sort of mind-shift, Hill says: "Through the aid of the sixth sense, you will be warned of impending dangers in time to avoid them, and notified of opportunities in time to embrace them." While this principle isn't the most straightforward - Hill admits it is generally not attained until age 40 - his basic claim is that your intuition will change. You'll have achieved a level of wisdom that will allow you to start making smart financial and life decisions naturally.